Hi friendly sailnetters. I need to vent a little tonight, and it is happening here so maybe others might see this and know they are in for pain if they are in the same situation. Late last year (December), my wife and I purchased a 35-foot Ted Brewer designed Jason 35. This particular boat was built from plans by the owner. It was a private sale. 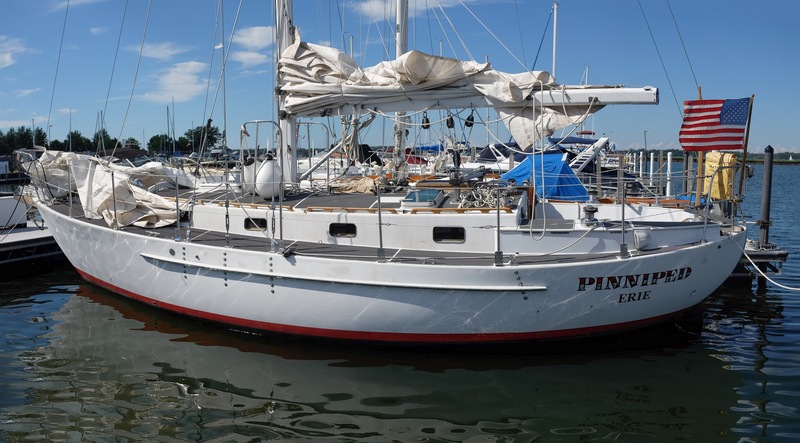 We negotiated with the owner after a great visit and sail in late summer. We made an offer contingent on survey. We received an absolutely glowing report from the surveyor, with a few notes on things that should be fixed. The owner voluntarily fixed most of them before we even got the report from the surveyor. We agreed to take care of a few items that were more personal preference (getting the propane cylinders inspected and replacing a section of fuel hose are important, but aren’t really matters of personal preference; buying a new VHF radio, though, is something I was certainly interested in doing myself!). By early November, we had agreed on a final price, and planned to meet after Thanksgiving to exchange dollars and paperwork. That happened as planned. We filed with the USCG to transfer the vessel certificate, as she was currently documented and we intended to keep her documented. Shortly thereafter, the government shut down and our application sat idle until last week. About three weeks ago, I filed the paperwork (and somewhat hefty check to cover state sales tax) with the PA Fish and Boat Commission. Silence for almost two weeks, then a voicemail at home late last week from a nice-sounding woman with PA Fish and Boat with some questions about our application. No problem, I thought. Their documentation for registering a USCG documented vessel was a little unclear, so I figured I checked the wrong box or something. It is apparently not permitted for one to transfer registration of a homemade boat in the commonwealth of Pennsylvania. I am a little shocked at this point, for a few reasons. First and foremost, we now seem to own a pretty boat that cannot be put in the water in Pennsylvania. Maybe more upsetting, though, was that this bit of information did not seem to appear on any of their forms, instructions, or the published guidelines for issuing registrations. After hearing this from the nice woman, I did eventually find one mention of the restriction, buried in the FAQ on the website. Additionally, the previous owner and I both spent a good bit of time figuring out how to work through all of the paperwork, and nobody either of us talked to caught it, either. Even MORE frustrating was the fact that the woman told me that this has apparently been on the books for a while, but they only started enforcing it last year. After talking with the office some more, and discussing that the boat has a hull ID listed with the Coast Guard and a manufacturers’ certificate submitted with the documentation application from when she was completed, the woman said that they are sometimes able to make exceptions, and would be sending my application to legal for review. So now we sit in limbo. I have a plans B and C if they don’t approve the registration, though I’d prefer not to have to go down those routes. Ok, venting done. I hope none of you ever have to deal with this. It is giving me some serious heartburn. Last edited by jwoytek; 11 Hours Ago at 09:36 PM. Ouch! Hope it works out. Since PA wants the revenue, it probably will. Otherwise, could you register it elsewhere? Other states probably aren't as silly about homebuilt boats. In any case, many states (and PA too, probably) have laws about boats that are in their waters for more than 60 days paying a "usage" fee equivalent to the registration cost, even if they're registered out of state or internationally. Connecticut says it uses these funds to provide pump-out stations. Sure. Once your boat's sale is registered somewhere, (Delaware is supposed to be cheap), PA probably won't care what the paperwork says, and will be happy to have you pay them to keep the boat moored in PA. Keep smiling - it looks like you have a nice boat, big enough to sail away from PA if you want! We live near Pittsburgh, which makes ports in Ohio about equidistant to Erie, PA, where the boat has been all her life and where we are planning to keep her. An out-of-state registration is certainly not out of the question at this point! Wow. Hope it works out for you. Simple enough I think, worst case do the transfer elsewhere. I believe Colorodo lets you do it remotely, no need to go there. Buyer then "imports" it from Colorado to whatever state they like, again no need to physically move the boat anywhere. Seems like something the surveyor should have known about. We are PA residents. We own a USCG registered vessel, documented out of Wilmington, DE. We have never had a PA state registration. We did register the DINK in DE so that we could use it independently from supporting the big boat. Is there some PA law that REQUIRES you to register a USCG documented boat with the state? My first thought is that there is absolutely no requirement for a USCG documented vessel to be registered in any state, whatsoever. It's the State's themselves that make those rules and they can require it, only if you're within their waters for more than a defined consecutive period of time, such as 90 days. So, the interesting dilemma is, if they won't let you register it, what's their requirement of you, after you've passed that time period? In a rebellious moment, I might say "if you won't take the money, I don't really need your registration for anything, so I'll just stay here without it." It seems to me the OP did not state the boat cannot be imported into PA.
Just that the transfer is not permitted within their paperwork jurisdiction. And I believe CO maybe others, does not require the boat nor any owners to be present there in order to use theirs. But is the BOAT in PA? In CT, harbormasters submit lists of boats anchored or moored, and after the requisite time period, the state sends owners invoices for the fee if they are not already registered. NY, CA, and many other states operate the same way.